‘Being different’ is a calling-card for most Electric Vehicle (EV) manufacturers and ‘built-for-purpose’ is the raison d’etre behind BMW’s intriguing offering that Iain Robertson has now driven in ‘unassisted’, strictly electric form; he’s impressed! Thanks to Octopus Electric Vehicles, I have been able to experience a number of the latest EVs that are currently available in the UK. My logic for dealing with Octopus lies in the fact that were I to relate with individual manufacturers, their undoubted marketing-led enthusiasm could colour my views of eco-transport. I believe that, as long as diesel has been demonised and petrol-power will soon follow suit, a sea-change in personal mobility is taking place. However, for the advancement of Electric Vehicles to occur, brand alliances need to be shelved. The simple truth is that we all need to take stock of our careless consumption of fossil fuels, which are a non-renewable resource. We have all seen, if not personally, then on television, the destructive impact of plastics in our oceans. We are informed about the impact that fossil-fuelled transport is having on our environment. Removing oil and gas from below land and sea, at an unabated rate, has a causal impact on climatic and geographical conditions (tsunamis, earthquakes, volcanic activities and other events). To effect change, the fundamental aspects of ‘for the greater good’ must be taken into account. Octopus Electric Vehicles is part of Octopus Energy, which is owned by the ethical Octopus Group, an £8.6bn funds manager and investor in renewable assets. Its neutral evangelism is non-salesy and unpressured. Octopus takes a view that is concomitant with its customers’ needs and desires, whether they be private, public, or commercial bodies, without brand bias, which is a valuable stance. Unconventional, no matter how long you stare at it, no matter how long you drive it, and the BMW i3 is weird. Of course, weirdness is part and parcel of venturing down a route to non-fossil fuelled mobility. 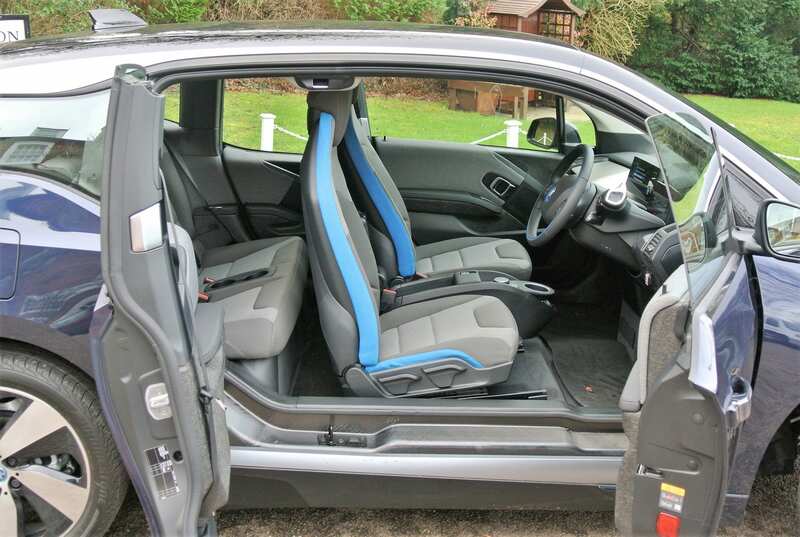 It is a means of attracting attention, which is appealing to some ‘eco-heroes’, but is also inherent to a vehicle that has been designed from the ground up to provide as close to a clean and green motoring premise as possible. 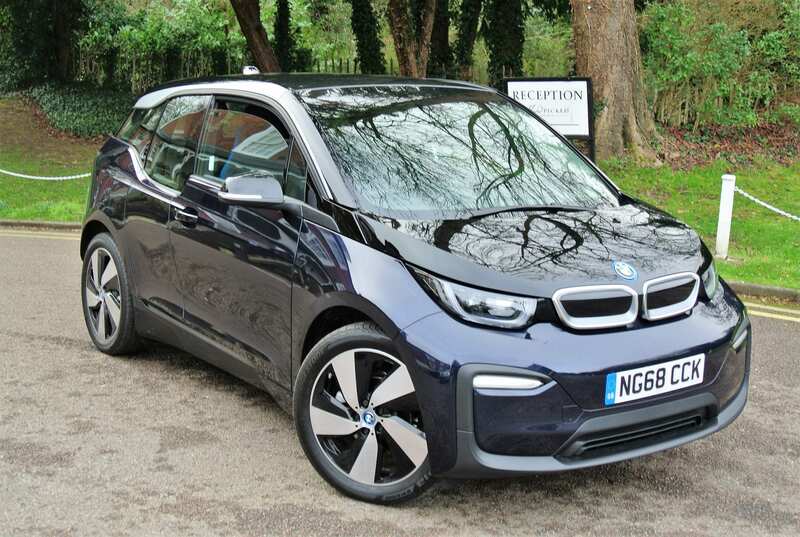 The i3 is skinny, not just in its specially developed, Bridgestone ultra-narrow tyres (produced to BMW’s precise clean and green specification) and lightweight 19.0-inch diameter alloy wheels, but also in its unusually tall five-door body. On a protective all-enveloping frame that is not dissimilar to that employed on the steel-framed smart car, produced entirely from lightweight carbon-fibre instead, BMW hangs what it calls ‘coach’ doors from its framework. Largely conventional front doors, which need to be opened to enable the rear-hinged and unconventional (unless you owned a Rover 90 in 1960) back doors to open and close ‘clap-hands’ and reveal a very style-conscious interior. 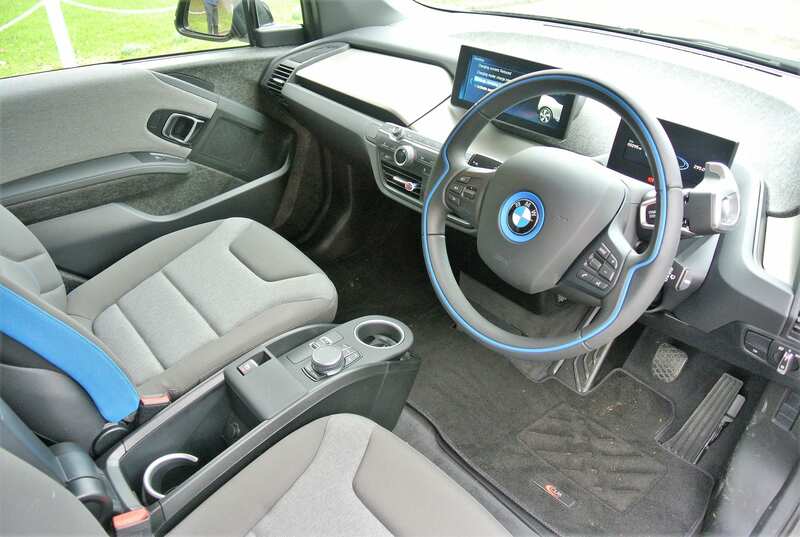 Having called the i3 weird, I should clarify by stating that it is also very cute, none more so than in its wonderfully designed interior. 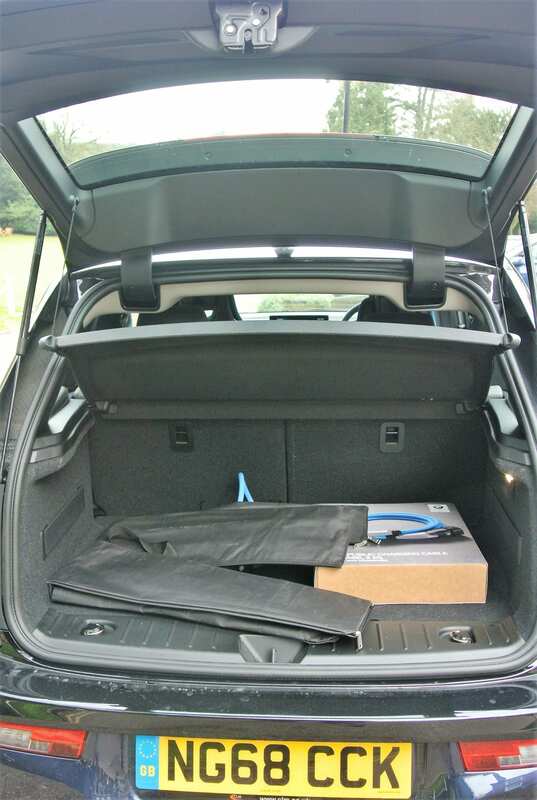 It may be an abbreviated BMW but as BMW is also a watchword for judiciously designed and impeccably detailed accommodation, the cabin is unerringly airy and roomy, with 260-litres of extendible boot space. The inevitable unconventionality extends to the pair of screens serving as main instrumentation, one ahead of the driver, with the other for sat-nav and connectivity in the top-dead-centre of the eminently practical dashboard. There is a relatively conventional main switch panel and the indicators and lamps are positioned where you would expect them to be. Needless to say, connectivity and driver assistance programmes proliferate. A nearly flat floor, which results from a platform that accommodates the Lithium-ion battery pack, adds to the impression of space and oddment storage is well-considered, with decent door pockets, centre console and dash-top troughs. If the trim materials look different, it is because they are different. BMW’s original remit, which has set an exemplary standard for all other EVs, was to avoid any element of the car’s construction that requires fossil-fuels to make it. As a result, even the cloth upholstery, known as ‘Kenaf’, is produced from the rapidly renewable malva plant that allows it to be a remarkable 30% lighter, more durable and just as comfortable and tactile as regular fabrics. The sparse application of eucalyptus wood trim is provided by sustainable plantations, the wood requiring around 90% less processing than any other. If leather is specified, it is tanned using olive leaves in a totally eco-friendly manner. You see, the whole point of travelling down an eco-route must be to preserve, conserve and sustain renewable resources and BMW lives up to the idyll. The latest all-electric i3 (also available in punchier i3S form) is easy to familiarise with. The main shift controller is a chunky device on the right-side of the steering wheel, where the push-to-start button is also located. Twist its end and select ‘Drive’ and the full experience becomes clear. Throttle control is smooth and linear, allowing the i3 to breach the 0-60mph benchmark in a bristling 7.0s, thanks to 167bhp and 184lbs ft of instant torque from its 120Ah (42.2kWh) Lithium-ion battery pack. Its maximum speed, which is only ever notional, is restricted to 93mph. 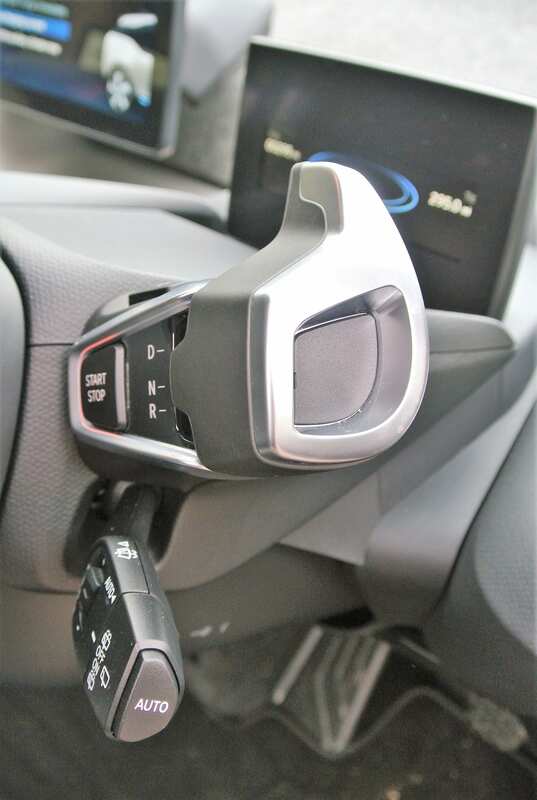 Throttle-off induces brake energy-recovery that also slows the car significantly, reducing a planned reliance on the brakes and turning the i3 into an effective ‘one-pedal’ driving experience. Its ride quality is firm but sporty and grip levels are outstanding. However, tipping the scales at around 1.2-tonnes, which is very light in EV terms and further proof, were any needed, that i3 is defiantly eco-aware, can play unfortunate dynamic idiosyncrasies on back lanes, or severe surface striations on main roads. The car can leap and pitch at speed so severely that it can be moved off the driver’s chosen line; not far but enough to be mildly uncomfortable, if not disconcerting. 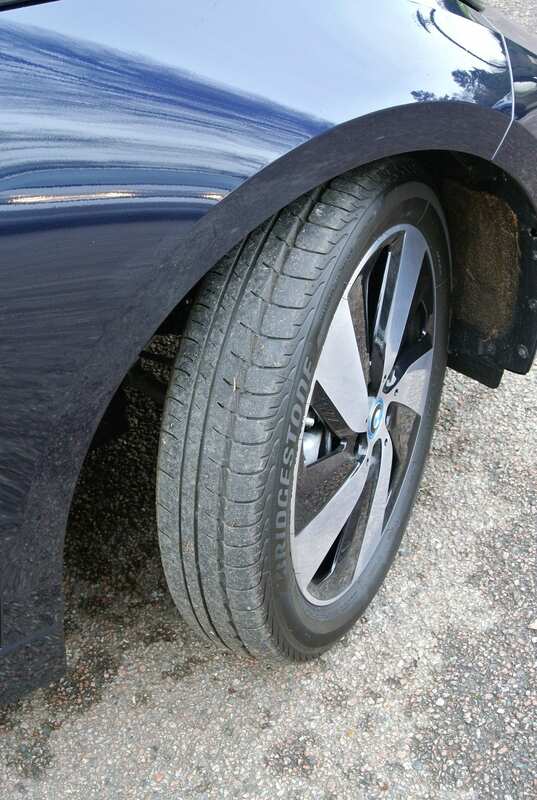 Of course, some of this lies in the higher air-pressure of the special tyres, designed to create a lower rolling resistance. The rest is due to the car’s determinedly firm suspension settings, which will work super-effectively on German autobahns but not so well on our third-world roadways. Fortunately, the car’s steering is fast reacting and very direct, with a London Taxi shaming, tight turning circle. Conclusion: List priced from £35,180, the latest i3, which is available in a couple of trim levels, has a range approaching 200-miles and is the only truly eco-friendly EV sold today. Incidentally, I mentioned ‘unassisted’ in the opening paragraph of this story, because early i3s benefitted from a compact petrol ‘assist’ engine, fuelled by a 9.0-litre tank and intended as a get-you-home device. Fortunately, BMW has increased the previously low EV mileage range of its latest i3.